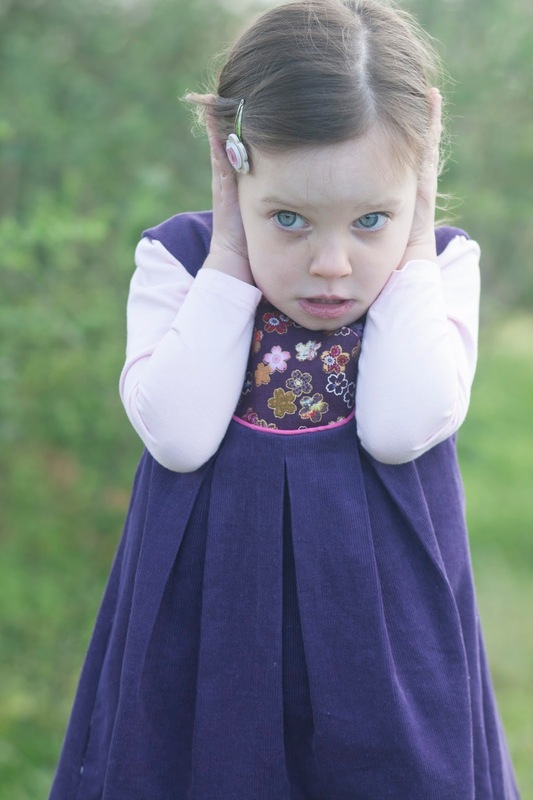 I wish this was a perfect blog post about a perfect dress I made for my Little Monkey accompanied by perfect photos... But it is not. This is not even a post about a new dress I am proud of. Because I am not. This is a story about a girl, a little girl, who feels like a fairy in her new less than perfect dress and a lesson she taught her mother. Rewind a few weeks back. 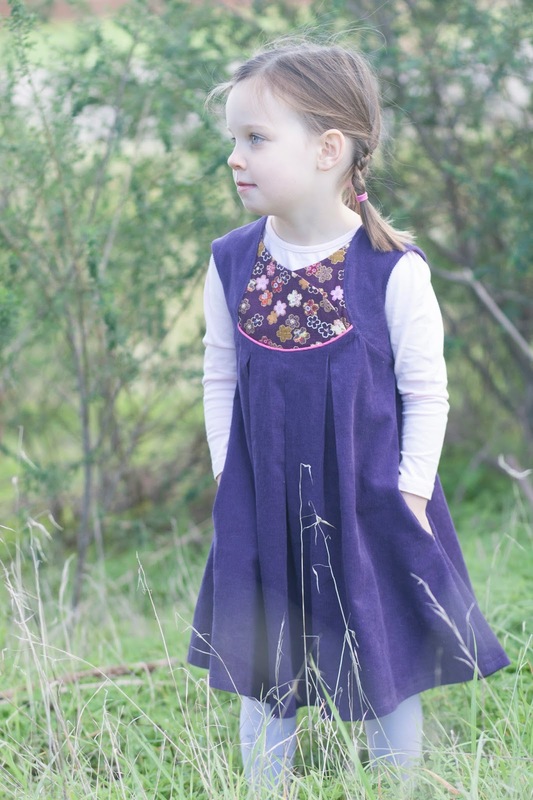 Willow & Co released their patterns, and I instantly fall in love with a few of them. 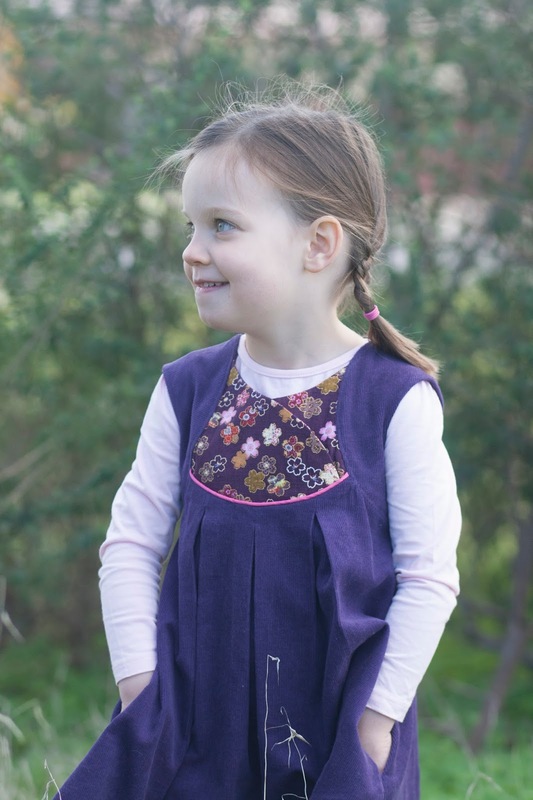 Fawn Lily tunic and dress pattern designed by Rebecca of Rock the Stitch got my attention straight away. I loved the lines, loved the 'vintage meets modern' look, loved the options... I just looooved it. So I decided Little Monkey needed one. I shortlisted a few fabric options for this dress and let Little Monkey choose the combination she liked best. Her choice did not come as a surprise. You see, purple has always been her favourite colour. Well, apart from a few weeks when she favoured pink. When she saw these fabrics spread out on the floor in my sewing room she pointed at them straight away. She specifically requested 'flower pockets'. ... I am not even sure what happened. First I made piping, and it ended up twisted. I was planning to add piping along the curved sides of the yoke, but it felt as if I completely forgot how to sew piping. After unpicking it for the 4th time I gave up. I thought the dress would look too purple and boring without a pop of colour, so I left twisted pink piping at the bottom of the yoke. Gr! Then the sleeves. I did not pay any attention to how I placed them. You can see the grain of fabric running in different directions. Ouch! Rebecca suggested light to medium weight fabrics for this dress or tunic. After I split a seam on a sleeve open while trying to pull my corduroy dress through it I understood why she suggested that. Perhaps if I sewed an A line skirt I would have not had to practice slip stitching. Bummer. Then it came to sewing the sides of the dress. The seams where the sleeves meet the body of the dress did not match up! I was ready to cry by then. I was very disappointed with myself and went to bed. In the morning I showed the dress to Little Monkey and she practically started jumping with excitement. She loved it! I thought I would take her to a railway for a photo shoot, but once we came closer to the train tracks she got so scared a loud train might come past while we were taking photos! She covered her little ears with hands. She was ready to cry. I got so grumpy! Why can't my child just stand still for a couple of minutes so I could take a few photos? Is it such a big thing to ask? By now Little Monkey's eyes were filling with tears and my husband looked somewhat concerned. I don't think he has ever seen me frustrated that much before. We walked away from the tracks and eventually Little Monkey let us take a few photos. I thought I had a lot of bad photos of a poorly made dress. I got over the whole thing, so we finished the photo shoot and went on with our lives. Once we all relaxed a little I realised I was a fool. The biggest fool in the crafting world. 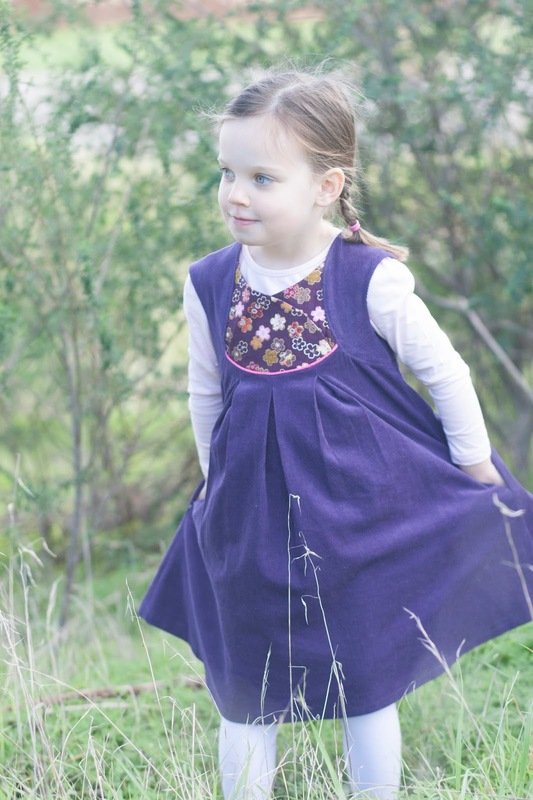 I was so focused on stitching, pattern placement, overall execution and photography I completely lost sight of what was important - my child was ecstatic about her new dress! She is three years old. She does not care if the sleeves on the dress look somewhat funny, if piping is twisted or if seams are matching perfectly. She finally got a purple dress with a full skirt, 'flower pockets', and she felt like a fairy. To her, this dress was perfect. That is the most important thing. That is why I sew. 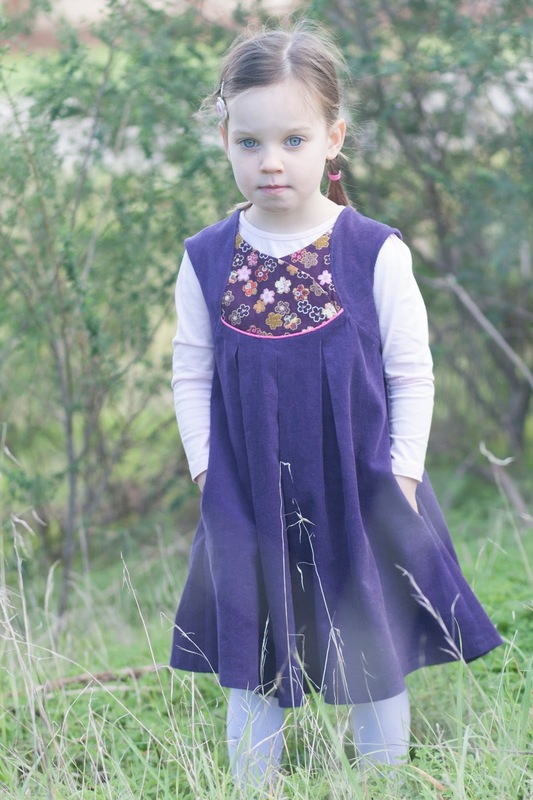 I will make another Fawn Lily dress for Little Monkey, but I will wait until it is warm again. In the meantime if you would like to see examples of beautifully sewn garments, visit Renee, Heidi, Tasha, Meg or Suz. Well, that's nicely put. And I love the pattern too! Pictures are not that awfull at all. But I recognise the thing about putting your priorities straight. Sewing (for me at least) is just a hobby and should be about having fun! Sewing is a fun hobby for me too Mieke. I am usually much more positive about my stuff ups (which really are learning experiences). I am glad I was able to wake to myself this time! Ooh I love this post because I can relate to you! I sometimes get the exact same way and in the end it is all silly. I don't sew to impress everyone, I sew because I enjoy it. It's fun to wow other people, and sometimes I put that as my focus, and then it isn't fun anymore. I need reminders of the reason I sew, simply because I enjoy it...that's it. And LM looks great in her new dress! I think you did a lovely job! We all know the frustration that can come with sewing. But we do it anyway, because of the reactions we get from our little ones, regardless of how well we think it worked out. 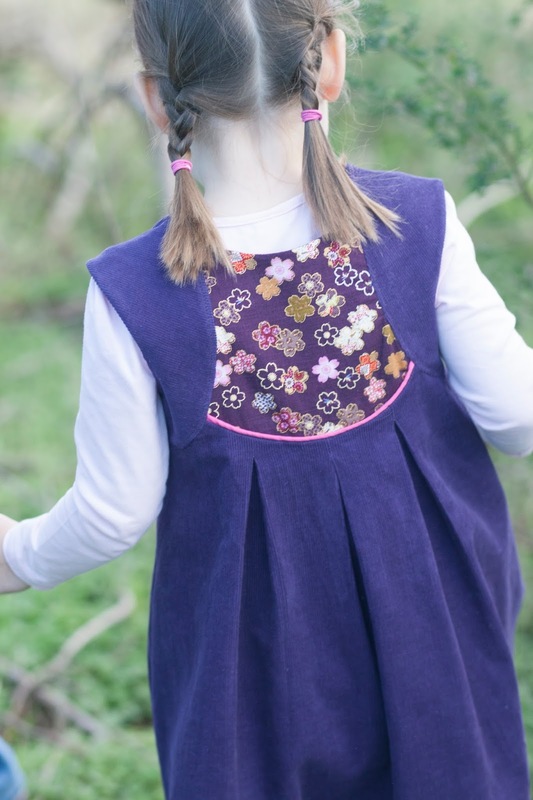 Your little monkey looks adorable in her new purple fairy dress with the all important flower pockets! Thank you Anne. LM's reaction is priceless. She is now very aware that people make things for her, and she asks who made this or that item for her. She is so adorable! I will take my frustration out on the next project! A great post, Jenya!!! And from where I'm sitting, I can't see any mistakes. I'll have to check out the pattern. It's a lovely style. You are WAY too hard on yourself - your sewing is beautiful and your standards are so high. Blogs full of perfection get kind of boring after awhile, don't you think? I see a beautiful little girl, in a beautiful dress made by a beautiful mummy with love in each stitch. Where can the flaws be in that. I know the feeling: sometime we only need to step back and think why are we there. I loved how you show yourself, I'm not sure I could do that! So recognisable!! But you made a lovely dress for a happy child. I made a dres for my 1,5 year old this week. First i found out the print was off grain.... The topstitching is not straight and the pockets moved while stitching them on, so they are not lined up the way i wanted (combined whit the slight offgrain) .... I hated it, but my daughter loves is, she keeps pointing at the print. I think we are often to focused on perfection!! We've all had projects like this (me more than I care to count). In the end, you are the only one that will notice any imperfections. I certainly wouldn't have known from the photos, especially of those with your daughter smiling! Спасибо, Алиса. Малышке, конечно, все равно. Просто мне таааааааааааааак хочется шить хорошо... Но ведь мы все делаем ошибки, правда? Я обычно адекватно реагирую на свои ошибки. В этот раз мне было просто стыдно за мое поведение. Буду исправляться :) And the great person bit - right back at ya! oh...what a sweet story..we can all get a bit like that can't we? taking it too seriously!! Poor darling getting scared of the trains!! 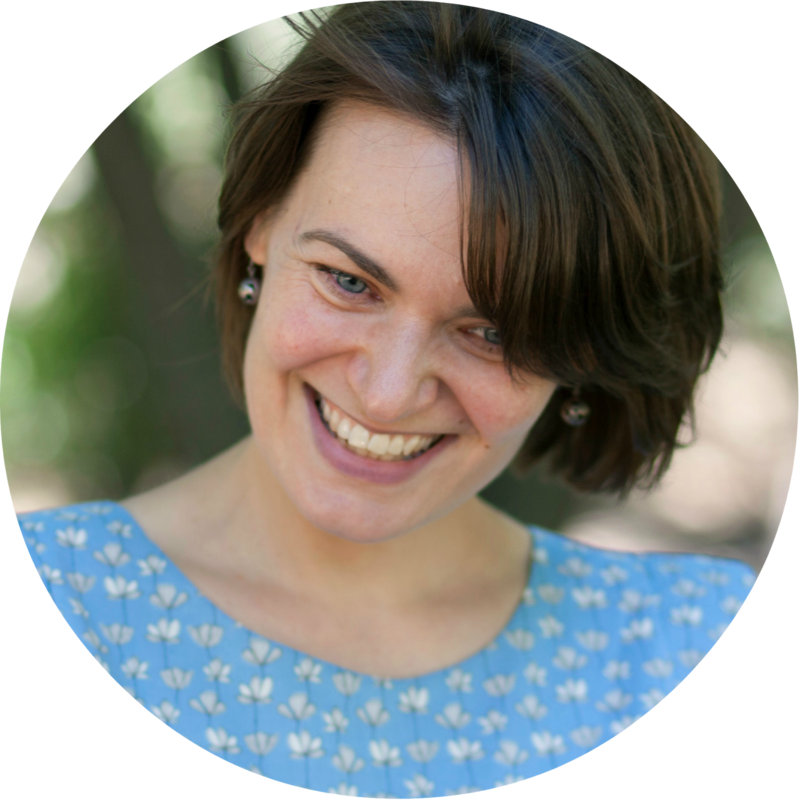 Thanks for sharing, your experience helps all your readers reflect on why we sew. Your daughter will grow-up so fast & you'll reflect back on these tender moments with her. Thank you Joy. I just hope she will forget her mum getting frustrated with her for being scared of a train! She will Jenya, I'm so grateful my grown children have forgotten some of the things that I did when I was learning to be their mom. Ok, delete the previous comment I accidentally published. LOL. I was trying to say that both the dress and the pictures look gorgeous. You are so right, sometimes it is easy to get your mind stuck on minor details, and miss the whole point. Great post! I see a lovely girl in a lovely dress. The dress looks perfectly beautiful in the photos. I understand the frustration in sewing mistakes and photo taking, and I think you are great for being honest. I try to take the photos of my daughter while she is having fun, whether we are out somewhere or at home and she is just dancing. Sometimes I can get great shots of her, but not the great shots that show off my creations, and that is frustrating. But forcing a little girl to model does not work out well, at least not with my girl. By the way, walking on the rail tracks is not illegal in Australia? I believe it is in the U.S., unless it is the track that is no longer in use. Thank you Annie. Oh I don't think forcing little people to do anything ever works! I was just silly, really. I think the dress is beautiful, when crafting for with monkey I can get really cross if I think its all going wrong, then I have to remind myself she's 3 and it really doesn't matter, so I know how you feel. Thank you Lucy. I guess we all do weird things at times, hey? Can't see anything wrong with it - looks like a beautiful dress (my favourite colour too Monkey!!) on a gorgeous girl made by an incredible mum! But thank you for being honest. I don't think we do that enough! I wouldn't notice any of the things you pointed out that weren't so well. I can see a beautiful girl wearing a dress her mom made her, according to her own requests... sometimes we are too hard on ouselves, but our kids are geniouses showing us the right thing... always. Thank you Magda. Kids are amazing, aren't they? They just tell you what they think and how they feel. They are so honest :) Gotta love it! Oh, this post made me smile. Our little ones love having something that mommy makes and don't care if it's perfect. I love that about sewing for them! And I've realized that I may never have perfect photos of my kids standing still but I shouldn't get frustrated at them. Looks like we are always learning, right? I think the dress looks great and I'm so happy she loves it! I can realte to this post sooooooooooo much!! yes we do want perfection but all we need is to create something that makes us and others happy ! I can't see anything wrong with your dress, very honestly. I think it looks fabulous and your girl does look like a fairy! Thank you ladies. I think perfection is a journey rather than destination. What I thought was perfect a year ago looks a bit wonky now. Which is a good thing, that means I am improving!